This tiny take on a classic backyard game lets you play ladder ball right on your tabletop. A round of ladder ball can be pretty invigorating. You breathe, focus on the top rung, and take toss. But the outdoor game might be too invigorating in the winter. Designers Derek Dahl and Sam Buss beat the cold by creating a mini, indoor-friendly version of the classic yard game. (It's handmade in Minnesota, where summer's all about the outdoor fun and winters are synonymous with "brrrrrrr.") 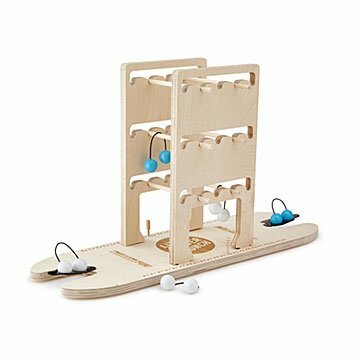 The wooden ladder set comes with baby bola (itty bitty golf balls on ropes), so you can play from the comfort of your table. Whether you're avoiding the chilly season with a cozy game night, or hanging out with friends any time of year, it's a surefire way to launch a good time. Remove upright walls from base board for storage. I bought this for my nephew (8 years old) and we had a great time playing. I would recommend it if you are looking for an out of the box board game idea for a kid!